VEP Healthcare, a staffing firm specializing in emergency medicine, needed a new space to support the company’s rapidly expanding team. 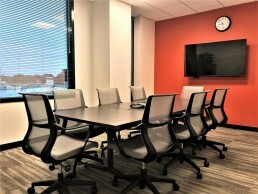 We worked with them to create flexible spaces, including a board room that could also function as a training room, in order to maximize their ability to use the room differently as their needs changed over time. To accomplish this, we ordered moveable tables with built in laptop outlets and installed a wireless AV system so presenters could freely move around the room. As a result, employees now have a space that can easily be reconfigured to fit their needs, whether they’re facilitating a training, working in a small group, or leading a large meeting. During the project, the construction process went smoothly. 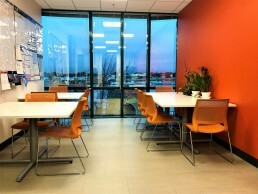 The employees were upgraded to sit-stand desks in the new space and the furniture turned out nicely.